A wonderful romantic comedy. Johnny Case (Cary Grant) has returned to Manhattan from a ski trip in Lake Placid. He met a beautiful young woman, Julia Seton (Doris Nolan), and they have decided to get married. However, there are several things they do not know about each other. Johnny has decided that he wants to take an extended holiday while he is young to find out who he really is and what he wants from life. However, Julia's family may have other plans for him. Julia's father is a wealthy banker who has pushed his son into the family business. The other member of the Seton family who is on Johnny's side is Linda (Katharine Hepburn), Julia's sister. She is the black sheep of the family and loves the free side of Johnny. In fact, she has fallen in love with Johnny. Now she tries to convince Johnny and Julia that this extended holiday is what he needs to do no matter what as well as hide her own feelings from everyone. This was Grant and Hepburn at their best. While this is not a traditional comedy it does have some pretty funny parts. Nolan was wonderful as the snobby Julia. This was a remake of a 1930 film starring Hedda Hopper and Mary Astor. 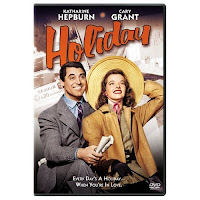 However, this is a must see for all Grant and Hepburn fans.